© Jo Baer. Courtesy Rhona Hoffman Gallery, Chicago. Photograph by R.H. Hensleigh..
Jo Baer, born Josephine Gail Kleinberg, is one of the few female artists recognized for her pioneering presence among the generally male, Minimalist movement of the 1960s. Like her friends and fellow proponents of the style—Donald Judd, Carl Andre, Dan Flavin—Baer applied a cerebral, almost ascetic approach to creating her systematic, abstract work. Unlike her peers, however, Baer did not remain true to the Minimalist ethos. In 1975, Baer abruptly retrenched. She renounced abstract painting altogether and dramatically reconfigured her approach to making art. Baer began to practice “radical figuration,” an approach to painting she characterizes as having “no pre-eminence of image or space,” but in which figurative imagery is undeniably present. For this reason alone, Untitled stands not only as a prototypical minimalist abstraction but as important evidence of a voice that is no longer heard-if one that silenced itself. That this painting is also as a stellar example of Baer’s work only increases its aura of rarity. Before repudiating abstract or non-illusionistic art, which she claimed in 1983, was “nearly meaningless,” Baer counted prominently among the New York art world. She studied art at the University of Washington, Seattle, but received her degree in 1949 in Biology. In 1950, she moved to New York and worked in the Graduate Faculty in Physiological Psychology at the New School in Manhattan until 1953. Her study of Gestalt theories of perceptual psychology involved examining the brain’s reaction to certain colors and patterns and the way “concepts like squareness, roundness, and so on, previously thought to be generalized or abstract, are considered the foundation of perception.” Though she was then painting in an Abstract Expressionist style, these studies clearly influenced her and were later expressed in the work for which she is best known. Around 1960 Baer met Sol LeWitt and Donald Judd and in 1964, Dan Flavin included her as one of the Eleven Artists in an important exhibition he organized. Baer joined this family of artists who were dedicated to dismantling what they understood to be traditional hierarchies among painting and sculpture in favor of creating a new language that blurred such distinctions and divisions. Their more “conceptual” relationship to producing art—creating a visual statement in which the individual thought, philosophy or psychological intent that went into making the work is considered as significant as the resultant object—clearly appealed to Baer’s analytic, intellectual approach. Untitled is representative of this drive and typifies a series she started in 1968 in which she began to emphasize the relationship of the frame to the picture plane. In these works, the optical and physical properties of the painting’s surface initiate the viewer into a voyage of perceptual discovery. 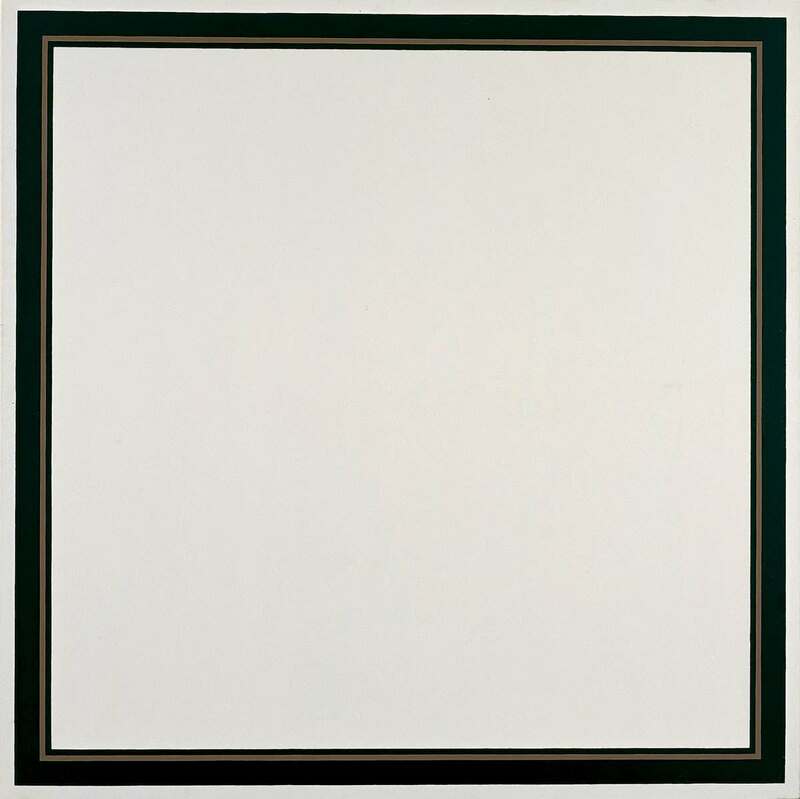 Not just a painting, Baer’s six-by-six foot object—an expanse of white canvas banded at the edges by a thin ribbon of warm brown paint, which is in turn contained by stripes of black pigment—is also an empty vessel beckoning tranquil observation. The soothing white interior seduces while the vibrating edges entice. While the direct physical relationship of the body to the object was an essential tenet of Minimalism, Jo Baer’s unique contribution was to expand its relationship to self-awareness by insisting on a physiological as well as physical engagement. Though she now regards this type of work as evidence of the “deep-set pessimism … of the high art of the ’60s,” Untitled might properly offer today’s viewer an untrammeled oculus into Baer’s optimistic goals for art in the 1960s.